Winner on the ITTF World Tour in 2015 in Bulgaria but in the final preliminary round of the Men’s Singles qualification tournament that precedes the Seamaster 2018 ITTF World Tour Lion Japan Open in Kitakyushu, it was defeat for Kim Donghyun; he was beaten by China’s Zhou Kai. The defeat was somewhat of a surprise, on the current Men’s World Rankings, Zhou Kai is listed at no.210, Kim Donghyun at no.62; a five games reverse was the order of the day (11-9, 8-11, 12-10, 11-8, 11-7). Defeat but there were more positives than negatives as the final preliminary round in the Men’s Singles qualification tournament concluded. Lim Jonghoon, Jeong Youngsik and most pertinently, Hwang Minha emerged successful; he upstaged his compatriots. Most impressively, in a close seven games contest decided by the very narrowest of margins, he beat the host nation’s Mizuki Oikawa (11-6, 9-11, 9-11, 11-8, 3-11, 11-3, 11-9). It is only this month that Hwang Minha has returned to the global order; he is listed at no.350 on the Men’s World Rankings as opposed to Mizuki Oikawa who appears at no.74. Success for Hwang Minha contrary to expectations, for Lim Jonghoon and Jeoung Youngsik it was as status advised but for the latter against an adversary who was no mean opponent and by the very narrowest of decisions. Lim Jonghoon accounted for colleague Choi Inhyeok (11-8, 11-6, 11-2, 9-11, 11-7); Jeoung Youngsik overcame China’s Yu Ziyang (11-3, 11-7, 6-11, 7-11, 13-15, 11-8, 11-9). 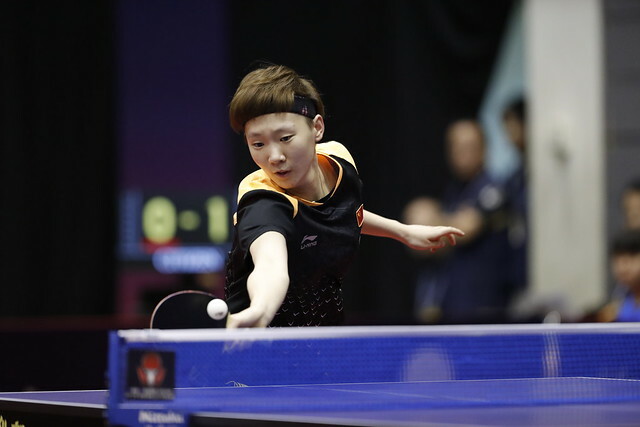 Notably in 2014 Yu Ziyang won the Men’s Singles title at the ITTF World Tour Japan Open, he beat Jun Mizutani in the final; at the time he was the youngest such winner. Later in the year he was crowned World Junior champion in Shanghai. We expected great things from the young man; for whatever reason, it hasn’t happened. In Kitakyushu, it was once again so near yet so far. Disappointment for Yu Ziyang but not for colleague, Liang Jingkun, the winner the previous week in Shenzhen when facing Germany’s Timo Boll in the opening round; named at no.82 on the current Men’s World Rankings, he accounted for Singapore’s vastly experienced Gao Ning, named at no.59 (11-4, 11-6, 11-5, 11-5). Success contrary to ranking for Liang Jingkun; for Yuta Tanaka in opposition to Japanese national team colleague, Masataka Morizono, the surprise in status was even greater. Named at no.331, Yuta Tanaka beat Masataka Morizono, listed at no.55 in a seven games duel decided by the minimal two point margin (2-11, 11-9, 7-11, 11-9, 13-11, 8-11, 11-9). An upset of note against one of the leading players on initial stage duty; for the others prominent names as play concluded in the qualification tournament, it was success. In addition to Lim Jonghoon, Hong Kong’s Ho Kwan Kit beat Chinese Taipei’s Yang Tzu-Yi (9-11, 7-11, 16-14, 11-4, 11-6, 11-6); the latter’s colleague, Liao Cheng-Ting overcame Germany’s Qiu Dang. Play in the main event commences on Friday 8th June.